1 April 2017- 31 March 2018. Gallery Two. Rochdale rose to prominence during the 19th century as a major mill town and centre for textile manufacture during the Industrial Revolution. It was a ‘boomtown’ of the period, and amongst the first ever industrialised towns. Toil, Trade & Titans explores how the social, economic and cultural impact of industry is manifest in the borough’s rich Fine Art and Museum collections. Featured artists include L.S. Lowry, Charles Burton Barber, Cornelia Parker, Taslim Martin, Nora Fok, Lesley Halliwell and Rosa Nguyen. It also provides further reflection on some of the same themes of labour, work, wealth and manufacture still being ‘mined’ by the artists in our contemporary art programme. Explore our under 5’s interactive boxes in the Art Gallery with tactile toys and beautiful books linked to the exhibition. Tuesday-Saturday 10am-5pm, Art Cafe: 10am-4pm. Please check during holiday periods. FREE admission to exhibitions and some regular activities. Talks, tours, performances, workshops and special events have a cost. 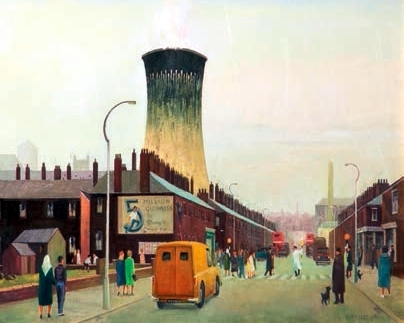 Image: Harry Kingsley, The Cooling Tower, Stockport, 1960.